Finding an all-season and all-terrain tire in one package can often be problematic for drivers of SUV’s and light trucks, but the Bridgestone Dueler A/T 694 Revo offers just that and a bit more. The first thing you’ll notice is the aggressive looks of the Dueler A/T 694 Revo tire. The sidewall design is unique for this segment of tires in that Bridgestone has maximized roundness because the rounder the tire the better it handles on dry and wet surfaces. Bridgestone has used its Comprehensive Tire Design method by which it makes provisions for excellent traction on both dry as well as wet conditions. This method also optimizes the tread design, casing shape, materials and construction to bring you a tire well suited to your needs. The tread block pattern makes it possible for even contact pressure, which has a positive effect on dry and wet traction. It also help to prevent irregular wear and enhances the life of the tire. Bridgestone has also used Super EPC in which sophisticated agents are used for anti-hardening and link stabilizing to improve wet surface traction to go along with greater flexibility by dissipating heat from the tire. The Dueler A/T 694 Revo provides a very smooth ride which results in great comfort. The Dueler Revo also has the advantage of having a dual layer tread in which the inner tread has greater exposure so that there is more consistent traction on wet roads. In fact the tire handles extremely well in wet weather and eliminates the risk of hydroplaning which helps keep you and your passengers much safer. Driving at higher speeds Dueler A/T 694 is made easier due to Bridgestone’s Spiral Wrap feature which helps the tire retain its original shape, even after a lot of high speed driving. Overall, the Bridgestone Dueler A/T 694 Revo provides excellent traction and handling in a variety of road conditions and terrains. The ride is good and the treadlife is above average. 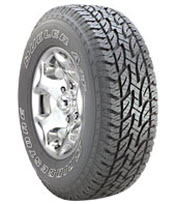 Prices for the Dueler A/T 694 Revo runs approximately $210 for the 17 inch series tire. Get the best tire price with Bridgestone coupon below, or find all other reviews or tire coupons here. Who Are Bridgestone Dueler A/T 694 Revo Tires Designed For? The Dueler A/T 694 Revo tire is for drivers of crossovers, SUV’s and pickups who are seeking a tough tire with excellent traction on all types of terrain including snow. Bridgestone backs up the Dueler A/T 694 Revo with a tread life warranty of 5 years or 50,000 miles and a uniformity warranty for the first 1/32 inches of wear. Materials and workmanship are covered for 5 years and include a free replacement during the first 3 years. Bridgestone follows that up with a prorated amount down to the final 2/32 inches of remaining tread depth.